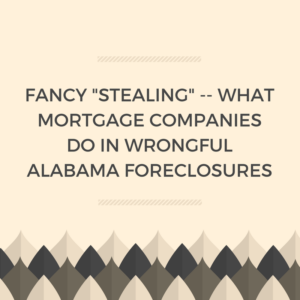 Are mortgage companies thieves when they do illegal foreclosures in Alabama? Absolutely! These companies come into our state and intentionally violate the law. They intentionally do bogus and wrongful foreclosures. For example we have a current case against Wells Fargo. Our client was facing foreclosure. He asked for the amount to “reinstate” his mortgage. Wells Fargo gave him the amount. He did not question it but paid it. Exactly by the deadline Wells Fargo gave him. Exactly to the account at Wells Fargo they told him to pay it to. Well . . . despite taking his money, Wells Fargo still foreclosed. Talk about having your cake and eating it also! It’s not enough for Wells Fargo to open bogus accounts by the tens of thousands — they also take your money and then take your home. You know what we call this? When someone takes something that does not belong to that person. Whether it is a pack of gum from the store. Or a car. Or money from an older person. But John you don’t understand — it is not possible for a big respected* bank like Wells Fargo to steal. The guys that run the bank are the pillars of the community. You can’t use a crude word like “stealing” when it comes to them! *Respected? Haha. That ship sailed long ago when places like Wells Fargo and other mortgage companies lied and about destroyed our economy with no apologies. Is it stealing if the thief is a company with fancy dressed executives? Yeah I don’t care how they look. How fancy of cars they drive. Where they live. When you take something not belonging to you, that’s stealing. No matter how fancy these bank executives might be at Wells Fargo or Bank of America. Or Ocwen or Caliber or any other of these places. How can a foreclosure be illegal in Alabama? There are so many more ways but these are just a few that we have sued for over the past many years. There is never a tactic or strategy that involves lying and dishonesty that the banks and mortgage companies will ignore. They will do anything for profit. So you have to protect yourself. No one else will. Certainly not the fancy executives at the banks and mortgage companies. What should you do if you are about to be a victim or already have been a victim of a wrongful foreclosure? Typically the best thing is to sue before the foreclosure. Get a judge involved. Otherwise in our “non judicial” foreclosure state, no judge will see what these criminals are doing. If there has already been a foreclosure, make sure you don’t lose your rights by ignoring an ejectment case. This is where you get sued to kick you out of your home. You have rights — don’t lose them. If you want to know your rights and options, call us at 205-879-2447. Ask for Randi to start the process of seeing if you can save your home. Or fill out our contact form and we’ll get right with you. Don’t let these crooks steal your home — fight back now.